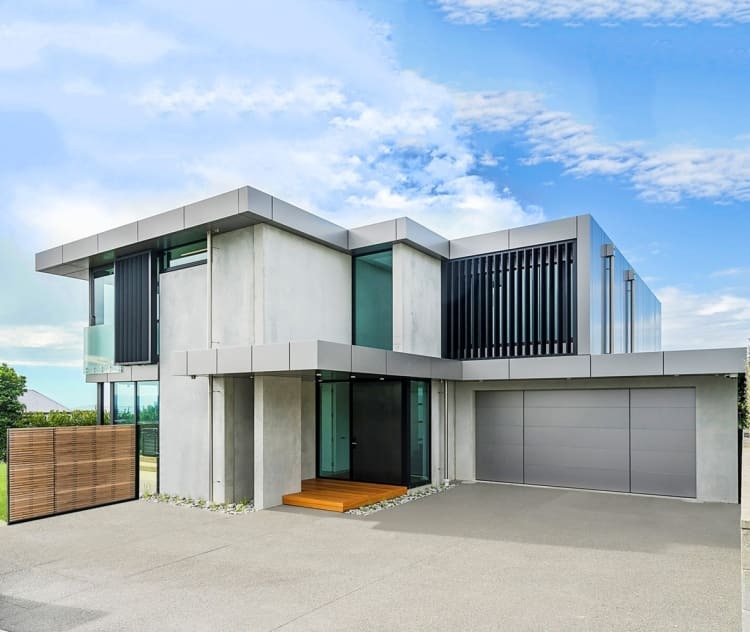 About the project (text supplied): Simple yet striking in a contemporary exterior of concrete, aluminium and glass, this Christchurch abode speaks volumes. As does the 407sqm interior. With its free-flowing spaces and masses of floor-to-ceiling glazing, the home’s intentions are clear – to deliver easy family living and uninterrupted views. A designer kitchen with walk-in pantry and wine cellar shows the owners’ discerning taste and allows for elegant entertaining. The latest audio technology and feature lighting enhance the mood. Refined living and dining spaces flow seamlessly to an elevated outdoor domain with barbecue for sunset socialising. The home theatre boasts black-out louvres and a drop-drown screen for a true cinema experience. The ground-floor den and office/gym enjoy easy flow through glazed sliders to the lower deck and spa pool. Four bedrooms and three bathrooms accommodate family life with ease. The master bedroom with ensuite exudes hotel-worthy luxury. Centrally ducted heating and cooling, in-slab heating and a gas fire are warming additions. What can we say, this is one hot property. John Creighton Builder also won both the Canterbury Region and National Craftsmanship Awards and the Canterbury Lifestyle Awards for best Bathroom and best Kitchen for this impressive home.